North America Microgrid Market size was worth over USD 2 billion in 2017 and the capacity is set to exceed 3 GW by 2024. Ongoing adoption of renewable energy technologies coupled with flexibility to connect with multiple power sources including solar, natural gas, hydro, combined heat & power (CHP) will drive the North America microgrid market size. Significant investments toward the expansion of decentralised grid along with resilience services to the communities during storms will positively impact the industry outlook. According to a report by FERC in 2016, the utilities across the U.S. invested USD 35 billion toward the expansion of transmission network. Aging grid infrastructure across the U.S. leading to vulnerability to power outages will complement the North America microgrid market. Need for reliable power supply coupled with government initiatives to electrify off grid areas will accelerate the industry growth. In addition, increasing adoption of distributed power generation technologies coupled with regulatory inclination to maintain balance on central grid will encourage the product adoption. Grid connected microgrid market size is set to grow on account of effective management of grid disturbances and faster recovery & response time to load fluctuations. In addition, integration of smart grid technologies coupled with reduced transmission losses will stimulate the business growth. Off-Grid segment is predicted to grow on account increasing investments toward decentralised energy technologies to strengthen the grid reliability. Rising adoption of self-generating plants across the various industries including petrochemicals, refineries and pulp & paper will further enhance the industry landscape. Simple control structure coupled with higher voltage carrying capacity will foster the DC microgrid market. Ongoing integration of various power sources including photovoltaic arrays, diesel generators, CHP plants and other distributed generation technologies will augment the business landscape. For instance, the Burlington DC microgrid project in the U.S. includes flow batteries, NG generator and solar rooftop panels. Hybrid microgrid market size was valued over USD 260 million in 2017. High efficiency, reliability, low operating cost and ease of compatibility with AC and DC grid are some of the key parameters which will favour the technology adoption. Enel in 2017, introduced a “Plug & Play” microgrid which includes two lithium and hydrogen energy storage technology with a capacity of 580 kWh and a solar PV plant of 125 kWp. Combined heat and power microgrid market size is predicted to expand over 18% by 2024. Higher efficiency and low operating cost are some of the key features which will encourage the product adoption. Greater reliability and lower emissions when compared with other production technologies will accelerate the business growth. Solar microgrid market will grow on account of favourable government policies toward upscaling the renewable power generation technologies. In addition, the declining cost of solar components coupled with advancement in the design & development of the devices will strengthen the industry growth. 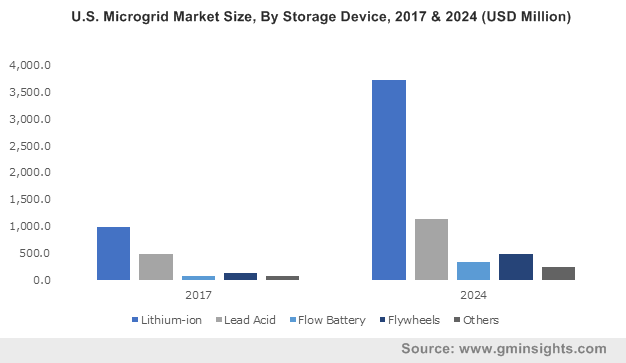 Lithium-ion microgrid market is set to exceed 1 GW by 2024. Longer life cycle along with declining raw material prices will positively impact the industry outlook. Higher gravimetric and volumetric density coupled with mass production by various industry players will stimulate business growth. Flywheel microgrid market size will grow on account of lower carbon emissions along with significant decline in operating cost. Advanced features including high responsiveness coupled with enhancement in efficiency and stability will encourage the product adoption. Increasing awareness toward sustainable generating sources across universities and colleges along with utilization of microgrids as educational & research platform will foster the North America microgrid market. Higher heating and electric load requirement coupled with independent power and thermal infrastructure will encourage the product penetration across the educational institutes. Need for cyber security and a stable electricity supply will stimulate the military market. Additional power backup by integration of energy storage and solar PV to existing diesel generators will complement the industry outlook. Under the SPIDER (Smart Power Infrastructure Demonstration for Energy Reliability & Security) initiative, the U.S. military has deployed microgrids to meet the mission critical energy requirements in case of attack on the utility grid. The U.S. microgrid market size will grow on account of high cost of electricity coupled with ongoing adoption of renewable energy directives across the nation. Increasing development of captive power plants along with government measures toward grid expansion will augment the industry outlook. The U.S. Department of energy under its Smart Grid R&D Multiyear Program Plan (2010-2014) has planned for expansion of microgrid network. Lawrence Berkeley National Laboratory (NBNL), American Electric Power and Wisconsin university is making significant efforts to apply the CERTS microgrids in the AEP’s test facilities across Ohio. 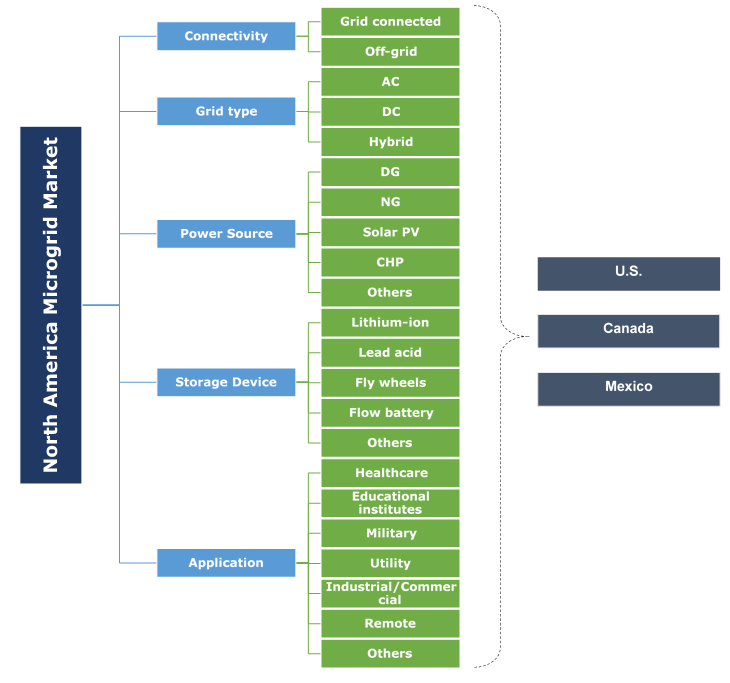 Key industry players across the North America microgrid market include Eaton Corporation, Schneider Electric, Caterpillar, ABB, Homer Energy, EnSync., Hitachi, Honeywell, Exelon Corporation, Lockheed Martin Corporation, Power Analytics Corporation, Toshiba Corporation, Advanced Microgrid Solutions, Viridity Energy Solutions and Tesla. Innovation in the product design along with extensive research and development activities pertaining to sustainable technologies are the key strategic measures adopted the eminent players across the industry. Declining capital cost along with achieving economies of scale in long run has further instituted a favourable strategic platform for the industry players. Microgrids are a group of distributed energy sources providing support to the central grid by load management along with the supply of ancillary services. They are capable of operating in grid connected and island mode. These systems comprise of storage devices including, fly wheel, lithium ion, lead acid and flow batteries that stores the additional power generated from the system. These grids enhance the integration of renewable and distributed energy sources helping to reduce the peak load.